Our favorite economist Jodi Beggs points out many “indicators” of recession are sexist, the result of male-skewing humor from the men who dominate the dismal economic science. We’ve had the skirt-length indicator, lipstick measures, and our favorite, the Hot Waitress Index — you know, the idea that pretty women lose jobs in real estate or sales when bubbles collapse and so are forced to serve food at the local bar. 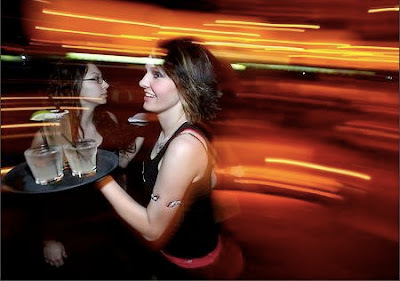 The prettier your waitress, the worse the economy. Sexist stereotyping? You bet. So the Puma sports brand is playfully fighting back with the PUMA Index, a stock ticker for cell phones showing models — male or female — who take off their clothes when the Dow goes down. Sure, you can pick a girl, but the default image on the app is a buff guy cranking weights, ready to drop his jeans. Economists, hope for a rally. Christoph Rehage walked 4,646 kilometers across China and forgot to pack a razor. Wonderful, gritty example of user-generated content. There’s an app for that. Cute example of consumers modifying an ad message to rebroadcast it in a more meaningful way, cause hey, back in the day, weren’t we all ex-somethings? Sad but true. Via Matt Mansour. 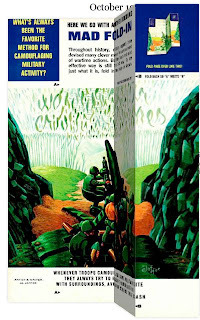 This weekend, we honor Al Jaffee with a link to the great NY Times piece on Mad magazine’s back-page fold-ins. If you’re wondering what this has to do with advertising, Jaffee and Mad inspired us to get into the advertising business when we were 7 years old and a neighbor, who was moving to college, gave us a box filled with early 1970s Mad magazines. Mad was something kids read before the internet, and energized us with hysterical parodies of movies, business, society, and especially advertising. Poking fun at advertising made it seem exciting, so we found our way constantly attracted to the business. Thanks, Mad. And thanks, Jaffee, for giving us the best final, folded piece of the delicious satire. People are strange, and the people who try to influence people are stranger. Somehow Mad made sense of the mad, mad world.